Bringing a new dog home, introducing it to you, your family, and residence is an exciting first step in establishing a sound and loving relationship with your pet. I'll try to offer essential, basic advice to make sure you bring your new dog home successfully. • a space to confine your puppy when you can't be there to watch it. Personally, I get a huge kick out of introducing a puppy to its new home, and I even like to have a camera on hand to save a few mementos for years down the road. My wife and I have experience with larger breed dogs such as Labradors and German Shepherds as those just seem to suit us. 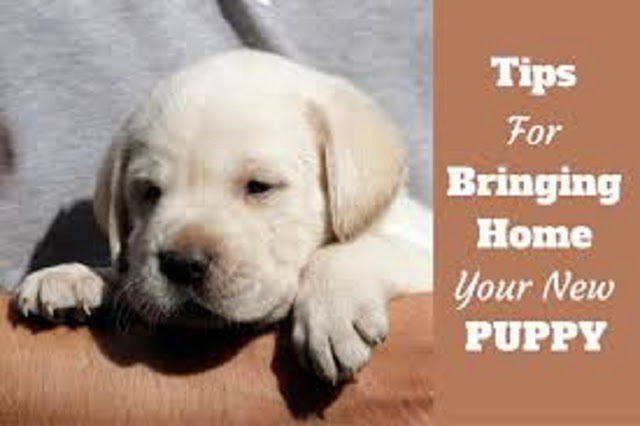 First--The very first time you bring your puppy home, give it a grand tour of your house or apartment or dorm room. I advise leading the dog on a leash as you do this. Make sure that you identify as many of your belongings as possible that you don't want the puppy to have access to. Put those items out of reach. Second--As you lead the puppy on its tour, give a gentle but sharp tug on the leash when it shows interest in items that are off limits. This is not to be punitive, and do not say "no." You can make a sharp, distracting sound, but do not at this time use the word, "no." At this stage, you are starting to familiarize your pet with limits. Be sure to lavish praise on your puppy for all right actions. Third--After you have shown the puppy around the house, introduce your pet to its food and water bowls. It is important that you do not change the location of the feeding place. Let the puppy say "hello" to its bedding. If you have a crate, you can let the dog start sniffing and investigating it. If the dog is 8 weeks, you may want to start crate training. The object of crate training is to let the dog assume ownership of the crate so that it will consider it as a sort of den. Fourth--When you feel that the dog has become accustomed to the residence, after a day or two, you can begin introducing it to the surrounding environment. However, if your puppy is under 8 weeks, you might want to wait a bit before you walk it around busy urban environments. Also, before you introduce your puppy to the outside environment, it would be a good idea to wait until the essential immunizations have been done so as not to risk violating city codes. Selecting and bringing home a furry-friend should not be taken lightly. While it is an exciting and fun experience, it also comes with responsibility. Mainly keep them healthy and give them a lot of love and then some.